How many of us regular write research reports to ourselves? Elizabeth Shown Mills' reports, normally available on her web site which is offline at the moment, are legendary! Other genealogists such as Elissa Scalise Powell champion "writing as you go." 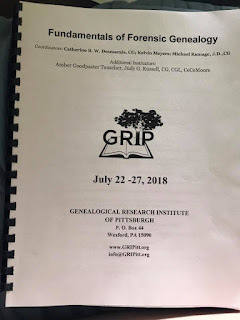 Writing the research as I go made me a better genealogist. I immediately spot the facts that need better evidence or which are missing. I can include these "problems" in my "Suggestions for further research" section until I can seek the needed document or address the problem some other way. If I send for a document, I can make a note of that and follow up in the future, if needed. It is easy to create your own research report template in a word processing program. You'll find examples of research report formats at the Board for Certification of Genealogists web site. Templates are also available for purchase from Brent Chadwick that include macros for commonly used citations. Last night I looked at an Ancestry DNA autosomal match who had a tree with names for himself and his father but no dates and no other persons. As I looked at the "shared matches," it was apparent he was matching on my paternal father's line. As I began doing "quick and dirty" work on his tree to see if I could identify the match, I found his ancestors living next to persons with the surname I suspected was the match. Both my match's surname's lines and the surname of interest seemed to follow the same migration trail. I also noted another name in close proximity which could explain something I've seen in my DNA matches--where the match appears to be on my maternal grandmother's line, but that it matches my Dad also, even though GEDmatch says my parents are not related. The matches are probably cousins to Dad but Dad is matching them on his paternal father's line rather than on the name from my maternal grandmother's line. I immediately knew I needed to document all that quick and dirty research and work my way back to the point where we may connect. There are some hints which may lead me to connect a dot or two to reach the ancestor we are fairly certain is ours from Y-DNA matching. Today I began writing that report. I didn't have a lot of time to do so because I had a couple of appointments that took up part of my day. However, the report is now twelve pages long and documents a couple of generations pretty well. I made one note for further research, but I was able to document most births, marriages, divorces, and deaths. I included censuses for the older generations. Much of the research I performed today was on living individuals and as such cannot be shared. I may work a little more this evening, but I'm happy with what I achieved for the day. I'm conscious of my goals and research questions as I'm writing it. The report format helps me stay focused on my goal instead of following tangents. As I write each individual's paragraph(s), I ask myself what documents are missing or which things need better evidence. The missing document I sought today was a birth certificate. I have plenty of other evidence of the birth date with no conflicting evidence, but the birth certificate would be a better source. Today is the last day of the Genealogical Research Institute of Pittsburgh session for which I enrolled. I took the Fundamentals of Forensic Genealogy course. I really enjoyed the course with Catherine Desmarais, CG, Kelvin Meyer, Michael Ramage JD, CG, Judy Russell JD, CG, CGL, CeCe Moore, and Amber Goodpaster Tauscher. 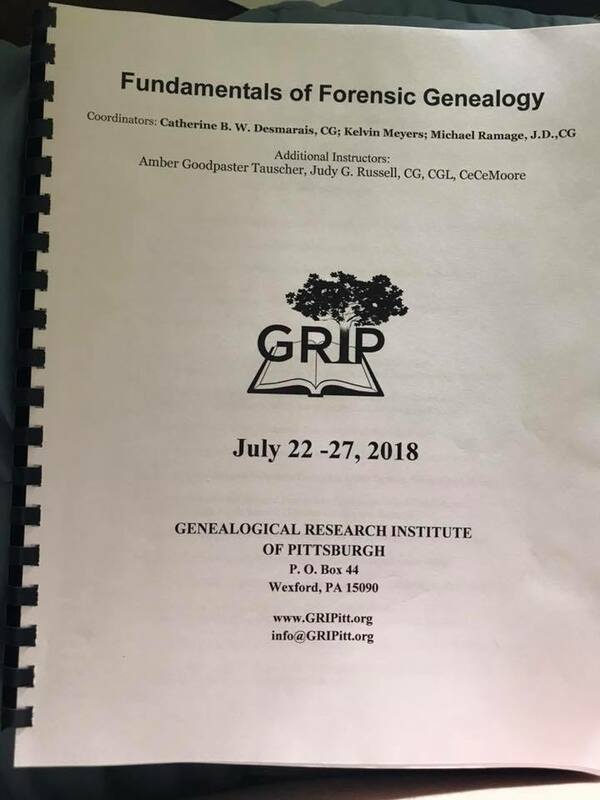 I gained a better understanding of the work of forensic genealogists and how I might prepare for supplementing my income with forensic cases in retirement should I choose to pursue this line of work. My advice for persons attending GRIP in the future is to stay in the Fairfield Inn or Homewood Suites nearby rather than the dorms. The beds were not comfortable, and we had to bring a lot of extra things (extra towels and wash cloths, mattress pad, extra quilt, wireless router which was advised but not needed, lamp, hair dryer, etc.) I did not enjoy the foods. They tended to put at least one ingredient in things which ruined dishes for me. For example, they ruined a perfectly good pork loin with mustard. They ruined other dishes by adding mushrooms (fungus). If you are used to the breaks at IGHR (Institute for Genealogical and Historical Research), these do not compare favorably. The same foods were out every day at break. Because I had a temporary crown, I was unable to eat any of them because they were all hard. Break food consisted of animal crackers, pretzels, M & Ms, and trail mix. However, the course itself was excellent, and that's why I attended. We'll receive our certificates before lunch, load the cars, and leave for home. I'm looking forward to seeing my cats! The publication Comptometer News appears to be a rich source of genealogical information (and photographs) if one's ancestor worked with the devices. Many issues from volumes one through ten (1926-1938) are available online at Internet Archive. The Felt & Tarrant Company produced the publication which appears to report news from comptometer schools across the nation, as well as a few international locations. Fischer, David Hackett. Albion's Seed: Four British Folkways in America. New York: Oxford University Press, 1991. This is not a formal review of the classic work Albion's Seed. It's more a few comments and reflections from reading it. Why did I wait so long to read the entire book? I lived in Cincinnati when the book was published. The public library there was wonderful. They had a copy, but like most books of a genealogical nature, it didn't circulate. I used it several times in the library, but I would only read a small bit each time. I see they own additional copies which circulate now. If they owned them at the time, they were always checked out or in the closed stacks, and I just didn't ask for them. I really should have purchased my own copy. I suspect it was because I didn't want to spend the time it would take to get through a 972 page book packed with information. Fortunately a study group organized by Miriam Robbins was just the thing to make me take the plunge. We'll be concluding our discussion this Saturday evening. With which culture do I most identify? That's a tough question. There are certain elements of each with which I identify, but I think the Cavalier Culture wins overall. I descend from all four cultures. Surprisingly, although I live in the "Backcountry South", I identify more with the Puritans, Cavaliers, and Quakers. I see some of the Backcountry spirit in some ancestors, but I do not strongly identify with it. I was also surprised at not understanding about half the expressions used in the section. I understood far more Cavalier and Quaker expressions. I even recognized more Puritan expressions than Backcountry ones. Isn't that strange? I'll be happy to sample foods from all four cultures, but there are good things and disgusting ones in each! My reading list just grew immensely. Fischer's footnotes always included works that captivated my attention. I want to read many of those now. I don't really enjoy reading about politics that much, but Fischer's conclusion included quite a bit about the ancestors of the United States presidents, the regional cultures from which they came, and how that influenced the president. I found it quite interesting. I know politics played a role in our ancestor's lives. The treatment of politics in a cultural setting is much more appealing than reading about elections and politicians without the context. One more thing . . . if you haven't read this book, don't delay! Order a new or used copy or check one out from your library and begin reading it! You will not regret the decision. You may choose to read it quickly, but you'll probably want to take your time to digest what you are reading. Obviously if you own your own copy, you will be able to take more time than if you rely on the library's copy. I grew up in a Mississippi home with slightly older parents and brothers who were fourteen and sixteen years older. With brothers graduating high school at ages two and four, I spent most of my childhood and youth pretty much as only child would. My parents loved to travel. I remember making long trips to visit Aunt Daisy in Iowa. On trips like that one, we usually stayed in motel rooms along the way. The vacations we really enjoyed were spent camping. We started out in a tent when I was about five. We went to a family camp in the Kiamichi Mountains of Oklahoma. Mom and Dad found a spot on a hill near the bathhouse. It rained quite a bit that week. Our next camping trip was made in a pop-up camper. We stayed in that camper a year or two. It really only had room to sleep with maybe a tiny storage space. We cooked meals outside on a camp stove. We graduated from that to a Starcraft which had a table where we could be comfortable when it rained as well as an indoor stove and sink. We made trips to Bull Shoals Lake and Eureka Springs in Arkansas, to Guntersville Lake in Alabama, to the newly opened Walt Disney World in Florida, to the Smokies, to Virginia, and many other places I've long since forgotten. We took it to Sardis Lake just for the weekend many times. It took only two and a half hours to make that trip. Eventually the Starcraft was replaced with a Coachman travel trailer. I was probably in the last couple of years of middle school then. They replaced the Coachman with an Allegro motor home sometime when I was still in high school. It was a very large rig and more than they really needed so they downsized after I was in college. I think the first smaller motor home was a Midas. They finished their camping in a Minnie Winnie which they purchased on the road in Florence, South Carolina. I think there was one other motor home in between those. Dad who was two years older than mom retired at 62; she retired at 65. When she retired, they spent a lot of time camping. They often made long trips, being gone for several months at a time. They made a trip to New England and a trip out west. They made many other trips as well. They had campground memberships which made it very affordable. They only paid $1 to $5 a night, depending on the agreements between campgrounds. Their favorite camping spot was in the Smokies at their "home" campground, Mill Creek Resort in Pigeon Forge. I lived in Cincinnati part of the time and often drove down on weekends when they camped there.When I moved to East Tennessee, they rarely stayed at my house, preferring to stay in the RV in Pigeon Forge. As they grew older, Dad's comfort level driving diminished, so they did most of their travelling during my breaks so I could drive. Mom called her love of camping and traveling "the gypsy gene." I remember telling her about all the places Levi Lantz lived. He was born in Mifflin County, Pennsylvania. He moved to Wayne County, Ohio, where he married Barbara Yoder. 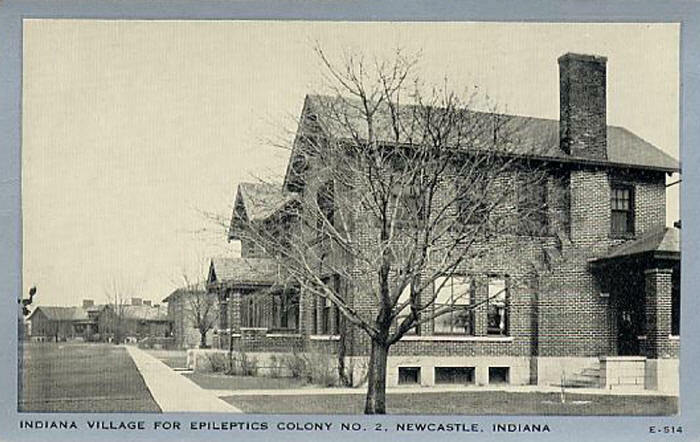 They moved to Knox County, Ohio for a brief time before returning to Holmes County, Ohio, which adjoined Wayne, to care for some of her aging relatives. They moved near Oak Grove, McLean County, Illinois, where my grandfather Abraham met his wife Laura. Levi, however, moved on to Howard County, Indiana, where his wife died. He then moved to St. Joseph County, Michigan, back to Oak Grove in McLean County, Illinois, to Johnson County, Missouri, and eventually to McPherson County, Kansas where he died in 1887. After I'd recited all his moves, Mom declared, "That's where I got my gypsy gene." I spent several hours Tuesday researching at the Calvin M. McClung Collection in Knoxville. I followed my plan to use published abstracts for Bedford County, Tennessee to help me trace my Mosely and related lines forward and to find things missing from my ancestral line research. I was unable to locate the family in 1880. Is the woman's name Anarchy as the marriage record suggests or Anica as the 1870 census suggests? Without further evidence I may never know. Perhaps I'll run across a record with additional evidence for the name. I certainly hope it turns out to be Anica. The tree owner provided a middle name for Martha in her tree. Martha was born before middle names were common. The person also provided the middle name of "Asbury" for Martha's husband. Since Francis Asbury was not born until after my ancestor William, this seems rather unlikely unless William's maternal grandfather, or possibly a great-grandparent, bore the surname "Asbury." However, men born during William's time only possessed a single given name. I definitely do not want to add either middle name to my tree without good documentation. The next reason I do not like to add smart matches relates to place name information provided. The individual provided a birth date for Martha of 1719. (I lack a birth date, but it seems a likely date since the youngest known child was born about 1740. I need better documentation before I add a qualifier such as "abt" or "est" to the date.) However, the birthplace given is Bertie County, North Carolina, United States. The last time I checked my American history books, North Carolina was a colony at the time, the Revolution had not been fought, and the United States had not been birthed in 1719. Bertie County (or Precinct) was divided from Chowan in 1722, so even the birth location is incorrect. The tree owner also places "USA" at the end of the death date, which occurred before the birth of the United States. The tree owner provides parents for Martha. I do not wish to add those until I establish the fact through my own research. I want to be fully in control of the data entered on my tree, and "Smart Matches" do not provide that opportunity. The default is that all new or improved information is added. While I like the idea of connecting with others researching an individual through some sort of confirmation, I do not want to be forced to accept their data in order to do so. Until accepting data becomes optional, I simply peruse the smart matches for clues, avoiding acceptance of questionable data. Of course, my tree at My Heritage is simply skeletal for DNA matching purposes in the first place. I like being able to see matching trees Ancestry without being forced to accept their data. I always ignore the trees, but I can still see those ignored hints if I click on hints. With MyHeritage, I want to be able to consult the tree but the only options on the review page are to confirm the match or reject it. At least by not confirming or rejecting the matches, I can still view the matching trees by looking at the pending smart matches. Edwards, Martin. Blood on the Tracks: Railway Mysteries. Scottsdale, Arizona: Poisoned Pen Press, 2018. An uneven, but mostly enjoyable collection of short stories compiled by Martin Edwards. "The Man with the Watches" by Arthur Conan Doyle - A mysterious death on a train is solved when a letter from abroad arrives. "The Mystery of Felwyn Tunnel" by L. T. Meade & Robert Eustace - The death of a signalman casts suspicion upon a railway worker. Before investigators arrive on the scene, they find another corpse in almost the same location. Science solves the mystery. "How He Cut His Stick" by Matthias McDonnell Bodkin - A thief gets off a train traveling at full speed. Dora Myrl figures out how. "The Mysterious Death on the Underground Railway" by Baroness Orczy - A look back at an unsolved murder about a woman poisoned on a train. "The Affair of the Corridor Express" by Victor L. Whitechurch - The son of a wealthy Londoner is kidnapped on a train while in the care of a school official, disappearing before the destination is reached. "The Case of Oscar Brodski" by R. Austin Freeman - Forensic evidence helps solve the crime. "The Eighth Lamp" by Roy Vickers - More suspense than mystery. A signalman sees a circle line train running after hours. Still enjoyable, even if the mystery element is not strong. "The Knight's Cross Signal Problem" by Ernest Bramah - A signalman performed his duties but an oncoming train sees a "go ahead" resulting in a crash. A blind detective figures out what happened. "The Unsolved Puzzle of the Man with No Face" by Dorothy L. Sayers - A corpse with a mutilated face appears on a beach with no clues to the victim's identity left. While riding a train, the detective overhears Lord Peter Wimsey's theory, leading to the victim's identification. "The Railway Carriage" by F. Tennyson Jesse - Solange Fontaine boards a train headed for London in Merchester. The occupants of her third class car speak of the execution of a young man that morning. The train crashes. With the next car aflame, a young man appears urging them to get out, but then he disappears. "Mystery of the Slip-Coach" by Sapper - A bookmaker's corpse lies in a railway coach with egg splattered upon the door. A bullet killed him. One passenger's luggage contains a firearm, but the bullet doesn't match. "The Level Crossing" by Freeman Wills Crofts - After a stock deal, a man is found dead at a railway crossing. "The Adventure of the First-Class Carriage" by Ronald Knox - A Sherlock Holmes mystery written by someone other than Doyle. "Murder on the 7.16" by Michael Innes - ***SPOILER***"Not a real murder" on "not a real train. "***END OF SPOILER*** Different! "The Coulman Handicap" by Michael Gilbert - A woman under surveillance gives her tail the slip in a case involving precious jewels. This review is based on an advanced electronic copy received from the publisher through NetGalley with the expectation of an unbiased review.